Long lasting protection without dyes or harsh synthetics. Dusk scent. Free of propylene gylcol, aluminum, and triclosan. Smells alright but simply does not work. I was using charcoal deodorant prior to this but switched because it became too abrasive to my skin. I had heard good things about this brand but I wore it for the first time today and I wreaked of B.O within an hour- and I barely sweat. I bought this for a husband and he has been using it for the last year and loves it! Very nice scent and works well. So nice to find a natural product that works just as well as a product with aluminum. I love the smell and my husband likes it which is a bonus because it's less chemicals. It lasts all day, I can still smell it when he gets home from work and he's in framing. Can't wait to see what other scents smell like. Like the idea, but it is not as effective as drug store brands, therefore cannot rate it highly. It actually needs to work all day without reapplication if it is to compare favourably. This is definitely a "manly" smell but, I love it so much that I use it. It works well but, I do need to reapply midday if I'm doing physical activity. Bought this for my boyfriend and he loves it. We both love the smell. My super picky husband, who does not like scents actually asks me to re-order this every time he runs out. He used a crystal for a long time because conventional deodourant aggravated his underarms but it was inconvenient to use...especially when he needed to reapply. And don't even think of dropping a crystal... needless to say, this deodourant works great, smells great and doesn't irritate his armpits...Wins all around. This is the only deodorant my husband will use that does not irritate his skin but keeps him smelling good. I like the scent too. Love the smell, love the product. Been using for 2 years now, great buy! My husband loved the smell of this, however he found he needed to reapply by noon....he was disappointed. Just got this product and used it for the first time, the scent is awesome, very masculine. The stick is quite soft almost like semi soft butter. Those who complain this doesn't last as long as traditional deodorants, remember this is a much safer and healthier product which is a worthy tradeoff. I highly recommend this product for its scent and being safe for long term use over traditional deodorants. Got this for my boyfriend for Christmas and we both love it! Will definitely purchase again. My husband loves this deodorant. I bought him one after I tried one of the women's ones. This scent is nice, and not over powering. My husband works long, hot, sweaty days doing manual labour and it works well for him. The stick itself lasts forever. Seriously, months! Does not last long enough, you will smell by mid-day. I have to go back to old spice. Too bad I spent good money on this thing. This product has a beautiful clean smell.I love this scent on my husband.He has three products from this line and loves them! This is the only natural deodorant that works for my husband. I also works better than most conventional deodorants that he has tried. My husband is a) a landscaper and b) very VERY particular. This is the only deodorant he will use. Smells great, doesn't irritate, and works. This brand name is best men's deodorant on the market. I have tried them all. 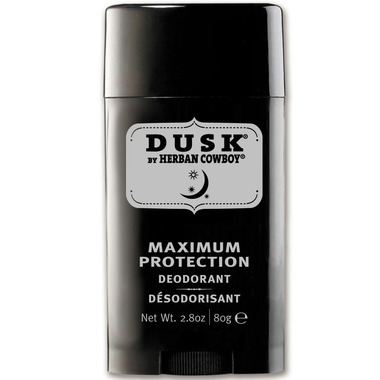 I am so happy to have found Herban Cowboy Dusk Deodorant. This is a natural, vegan deodorant that works. The scent is not overpowering, but does a great job. I don't have to fear my partner's armpits any longer! My husband loves the fragrance. He has started using it on weekends and so far he is very satisfied with it. The only difference he has mentioned is that it is slightly softer, feels more like a solid gel stick compared to what he is used to with commercial deodorants. Great product, no harsh chemicals. Excellent! Smells good and works! Great product... the fragrance is very masculine and it works as intended without any irritation! This one is effective and is my current stand by while I search for 'the' natural deodorant. It smells like I am getting geared up to go out clubbing, when all I am really looking for is something to wear at work for 8 hours without BO. I'd say this one lasts about 5-6 hours and could be reapplied to regain it's effectiveness. 'The' deodorant for me would be a natural stick that smelled like nothing. No fragrance, no BO. Tried Green Beaver fragrance free and Tom's Mountain something and they both failed. Toms miserably and Green Beaver after about 3 hours. Effective and very mild fragrance. Other natural deoderants my husband has tried have failed. This is the only one that works as well as a name brand, but doesn't have toxic chemicals! Smells great too. I am still looking for the perfect deodorant as I haven't found it. It is quite difficult to find something that does not contain chemicals including synthetic fragrance and works. I gave this deodorant a try even though it has synthetic fragrance, which is not great for your skin as it could cause allergies and immunotoxicity problems according to EWG. I have to say that it is quite effective. It smells like one of those brand name deodorants from a drug store. However, this one at least doesn't contain aluminium or parabens. No rash or skin irritation. Smells great and holds up to my P90X workouts. Best deodorant I've ever used and I've tried a lot of natural and non-natural brands. Smells very similar to original Old Spice. It keeps its scent all day for me and hasn't caused any irritation. Hasn't stained or left any visible residue, and feels nice and dry. The most appealing part of this product is that it is all organic and natural. It has a nice scent, although somewhat unique, it is not overpowering at all. This is only a deodorant, so keep that in mind. Anything beyond light activity or minimal stress will make its effect diminish quickly. I wouldn't expect this to hold strong for a long strenuous day at work, but if you reapplied it once it would be fine. I bought this for my husband so he could stop using the nasty chemical laden deodorant he had been using. I was worried it wouldn't work for him as he's a big man and sweats a lot at work. I am very pleased to say he Loves this deodorant and says it works fantastic! Definitely a great deoderant! I used it for a few weeks before switching back to the regular antiperspirants during a heat wave, my skin got very irritated and dried out. This stuff doesnt work as well as the regular stuff, I definitely sweat if its 40C out or if I'm in a high stress situation (a work presentation in front a group of VP's did it) but for regular day to day its just fine and no harsh chemicals. So far so good! It has a great smell to it when applied and lasts most of my working shift. I did notice it has mineral salts as an ingredient and am worried about a possible allergic reaction, but as i said so far, so good(no probs yet). This seems to be a great product. After trying this deodorant my husband will never use anything else. Smells great, lasts all day and no threatening ingredients. This has been the only natural deodorant that has worked all day for my husband. His favorite by far!! Best. deoderant. of life. This is the only product that doesnt irritate my husband. The smell is to DIE for. He loves it and so do I. PLus it lasts all day and is all natural. No reason not to!!! This is great - nice smell, lasts the whole day and best of all doesn't cause my armpits to itch like so many other products do (i.e. everything in Lawtons)! Recommended. My husband and I both loved this scent, it works great! You may have to apply twice a day but with it being free of dyes, alcohol, aluminum, etc - it is very worth it! I bought this for my man. I loved the scent - so did my sons, so I'm buying 2 more! I also bought the 'Wild', but personally it was too strong smelling for them all, me too! .. oh and it works! go figure! Although I have to say It works better on my sons in their 20's as they haven't polluted their bodies with chemicals over the years. Less build-up of toxins in the system to release. If you've been a regular user of Antiperspirants don't expect miracles - your body needs time to clean out and adjust to the natural deodorant. After reading all the great reviews I had high hopes for this product. Unfortunately my husband was not too crazy with the performance of this deodorant complaining that it didn't work as well as Old Spice. Works well; smell is okay. Other naterual products such as Terra Naturals are just as effective and aren't as expensive. The only deodorant I will buy from now on, long lasting protection against odour and a long lasting stick of deodorant. A great buy if you're looking for a healthier alternative to mainstream antiperspirant.